The global fifth wheel coupling market is expected to surpass US$ 500 Mn by 2027, expanding at a CAGR of more than 4% during the forecast period. The market for fifth wheel coupling is anticipated to expand at a significant growth rate during the forecast period, owing to the expansion of industries and improving road infrastructure. The fifth wheel coupling market is primarily driven by rising global population, which in turn has considerably boosted the demand for consumer goods, thus significant expansion of agriculture and manufacturing industries fueled the demand for transportation sources. This, in turn, is boosting the demand for heavy trucks that are integrated with fifth wheel couplings. Moreover, improvement in road connectivity is propelling the market for fifth wheel coupling. Cost-effectiveness of transportation by trailer trucks is a key factor driving the fifth wheel coupling market, owing to the high cargo-carrying capacity of trailer trucks, which results reduced number of trips. 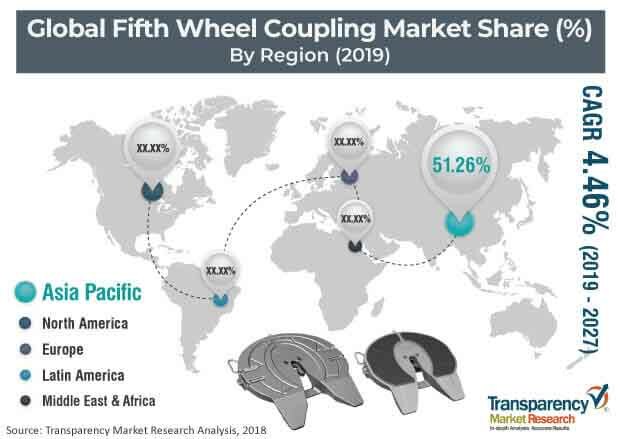 Emphasis by governments to improve road connectivity is likely to drive the fifth wheel coupling market during the forecast period. High investment for developing road connectivity in the U.S. after the Second World War led to the development of a significantly large road transportation and fifth wheel coupling market. Low speed of the heavy trailer trucks and presence of smaller roads and sharp turns on roads are major factors restraining the fifth wheel coupling market. Massive backlog in proper maintenance of roads is also a major factor that is likely to hinder the demand for road freight transportation during the forecast period. Furthermore, toll roads or booths lead to considerable time loss, which results in slow transportation of freight. Poor road infrastructure coupled with a lack of intent to improve transport facilities is expected to restrain the demand for road freight transportation and consequently, hamper the fifth wheel coupling market during the forecast period. The global fifth wheel coupling market has been segmented based on mounting type, coupling, material, operation, load carrying capacity, number of pins, application, sales channel, and region. In terms of mounting type, the fixed segment dominated the global fifth wheel coupling market owing to its extensive utilization in heavy trucks that witness significant demand for fifth wheel coupling. Numerous advantages of sliding fifth wheels have made it highly popular; however, they are mostly utilized to trail recreational vehicles (RVs) and trailers attached behind light trucks. In terms of coupling, semi-oscillating segment is a highly attractive segment owing to its application in most of the on-road trailer trucks, as it provides better stability as compared to the other segments. Fully oscillating fifth wheels are mostly employed in off-road vehicles for greater movement of linkage to adjust according to the driven surfaces. Compensating coupling linkage is highly unstable and it makes handling of the vehicle comparatively challenging. In terms of material, the steel segment is likely to dominate the global market during the forecast period, as steels possess high tensile strength and is cost-effective as compared to rest of the segments. Furthermore, aluminum fifth wheels couplings are only manufactured by SFA Holland in very limited numbers. Aluminum fifth wheel couplings are significantly lighter than steel couplings, which make the trailer tractor more efficient as compared to the tractors installed with steel fifth wheels. However, aluminum fifth wheel couplings are comparatively more expensive and hence, witness lower demand as compared to steel couplings. In terms of number of pins, the single pin segment held a major share of the market, owing to its capability to withstand significantly high payload. According to a leading manufacturer SAF Holland, in most cases, single pin has the ability to withstand a load of 80 tons. Furthermore, trucks with higher load capacity are integrated with double pins such as RoRo trucks used on seaports. In terms of sales channel, OEM was a leading segment of the fifth wheel coupling market, as most fifth wheels possess significantly high lifespan and usually last the entire life of the tractor. The aftermarket segment is primarily expanding due to rising demand of fifth wheels for light trucks. Key players operating in the global fifth wheel coupling market are JOST Werke AG, SAF-HOLLAND S.A., SOHSHIN Co.,Ltd., Fontaine Fifth Wheel, RSB Group, Tulga Fifth Wheel Co., Guangdong Fuwa, Hunger International GmbH, TITGEMEYER GmbH & Co. KG, Foshan Yonglitai Axles Co., Ltd, Shandong Fuhua Axle Co.,Ltd., Magnum Trailer & Equipment Inc., York Transport Equipment (Asia) Pte Ltd., Land Transport Equipment Co.,Ltd, CM Trailer Parts Limited, and Horizon Global Corporation. This report analyzes and forecasts the market for fifth wheel coupling at the global and regional level. The market has been forecasted based on volume (units) and value (US$ Mn) from 2019 to 2027. The study includes drivers and restraints of the global fifth wheel coupling market. It also covers the impact of these drivers and restraints on the demand for fifth wheel coupling services during the forecast period. The report also highlights opportunities and future scope in the market at the global and regional level. The report comprises a detailed value chain analysis, which provides a comprehensive view of the global fifth wheel coupling market. The Porter’s Five Forces model for the market has also been included to help understand the competitive landscape in the market. The study encompasses market attractiveness analysis, wherein the service is benchmarked based on market size, growth rate, and general market share. The study provides a decisive view of the global fifth wheel coupling market by segmenting it in terms of mounting type, coupling type, material, operation, load carrying capacity, number of pins, application, sales channel, and region. These segments have been analyzed based on present and future trends. Regional segmentation includes the current and forecast demand for fifth wheel coupling in North America, Europe, Asia Pacific, Latin America, and Middle East & Africa. The report also covers the demand for individual segments in all major countries across all the regions. The study includes profiles of major companies operating in the global fifth wheel coupling market. Market players have been profiled in terms of attributes such as company overview, financial overview, business strategies, and recent developments. The global fifth wheel coupling market is primarily driven by the increase in trade volume and proportion coupled with a rise in industrialization and development of road infrastructure suitable for trailer trucks. Rise in industrialization and expansion of manufacturing and agriculture industries in majority of developing countries around the world have led to extensive usage of road freight transportation, which in turn is fueling the demand for fifth wheel couplings. The report provides the estimated cumulative market size of fifth wheel coupling for 2018 and forecast for the next nine years. The global market size has been provided in terms of volume and revenue. Market numbers have been estimated based on mounting type, coupling type, material, operation, load carrying capacity, number of pins, application, sales channel, and regional segments. Market size and forecast for each mounting type, coupling type, material, operation, load carrying capacity, number of pins, application, and sales channel have been provided in terms of global and regional/country markets. In order to compile the research report, we conducted in-depth interviews and discussions with a number of key industry participants and opinion leaders. Primary research represents the bulk of research efforts, supplemented by extensive secondary research. We reviewed key player’s product literature, annual reports, press releases, and relevant documents for competitive analysis and market understanding. Secondary research also includes a search of recent trade, technical writing, internet sources, statistics data from government websites, trade associations, and agencies. This has proven to be the most reliable, effective, and successful approach for obtaining precise market data, capturing industry participants’ insights, and recognizing business opportunities. Secondary research sources that are typically referred to include, but are not limited to company websites, annual reports, financial reports, broker reports, investor presentations, and SEC filings, internal and external proprietary databases, and relevant patent and regulatory databases, national government documents, statistical databases, and market reports, news articles, press releases, and webcasts specific to companies operating in the market, National government documents, statistical databases, and market reports, OICA, JAMA, Factiva, etc.